The first generation of my family to come from Turkey, my grandmothers and my aunties, used to sit and rest a bit in the afternoon. After preparing dinner and finishing their housework, they traded bits of gossip about the community and themselves (char lashon) with a cup of Turkish coffee and a biscotio in hand. 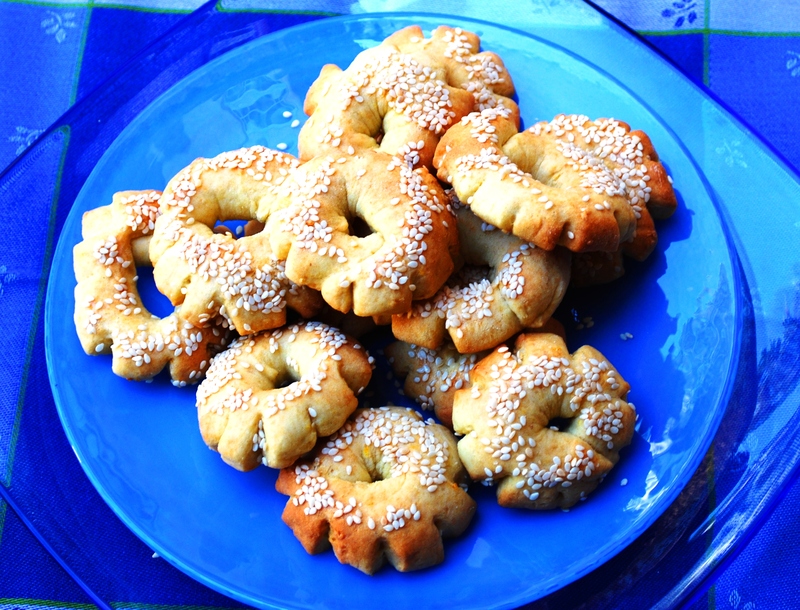 These circular biscuits topped with sesame seeds, are not sweet like cookies, nor are they savory. They are perfect for dunking in coffee, espresso, or even tea. Biscotios keep a long time in an airtight container and are very portable. It is good to keep a couple in a small plastic bag in the bottom of your handbag, just in case. I guess we all turn into our mothers or fathers as the case may be, eventually. Preheat the oven to 350º. Crack 4 eggs in a glass bowl and check for shells and blood spots. Place the eggs in the bowl of a stand mixer and beat on medium for a minute, add 1/2 cup of orange juice. Beat until well blended. With the mixer running on low speed, slowly add 1 cup of sugar then 3/4 cup of oil. Lastly add the Masticha. Continue mixing until very well blended. In a separate bowl combine 1 cup of the flour with the other dry ingredients and the orange zest, then add it to the liquid while the mixer is off. Start to mix at the lowest speed, then raise speed to medium and mix until well incorporated. Turn off the mixer again and add the last 5 cups of flour. Start the mixer on the lowest speed until the flour begins to incorporate, increase the speed to medium for a couple of moments. The dough should be soft, but not sticky. Remove the dough from the mixing bowl, gather it into a ball, and let the dough rest for 10 minutes on your work surface. Wood or stone is best. Divide the dough into 4 quarters. Wrap 3 of the pieces in plastic wrap. Roll the remaining piece into a log on a very lightly floured surface, about 1 and ½ inch in diameter. Cut the log in 20 even pieces. Roll each piece out to a 4 and ½ in rope, nick the rope on the outer edge creating a design, draw into a circle, and pinch the edges together. Arrange your two shallow bowls with beaten egg and sesame next to your cookie sheets. Line the cookie sheets with parchment paper or a silpat. Dip each biscotio into beaten egg on one side and then sesame seeds, place the biscotio on the prepared baking sheet, sesame side up. Bake at 350º for 15 to 20 minutes until golden in color. Dry the biscotios out in a 200º oven for 30 minutes until crisp. I turn off the oven after the 30 minutes and leave them sit inside for a couple of hours. Cool them on a rack and then store them in an airtight container. This recipe makes about 80 biscotios. Just wanted to let you know I made the biscotio recipe. I couldn’t find the ground anise in the supermarket so I substituted 1 tsp of vanilla. The biscotios are delicious. I am sure I will be making them often. Thanks so much for sharing your recipe. Hi Norma, you can find the ground spices at some online sources, Try Penzies, Kalustyans, or Surfas. I am glad you enjoyed the biscotios. Hi Linda! I can’t be completely, absolutely certain that these are the same cookies that my grandmother (she of ‘bee-yeek-oos’ fame from my earlier post) made, but going by the photo you have here, and the ingredients and the way you’ve described them, these very well could be the ones I remember with the same fondness as my beloved bee-yee-koos/burekyas! They weren’t overly sweet, but they weren’t overly savoury, either – just as you’ve described above. But they were very buttery, with an egg wash on top, and sometimes sesame seeds. What did it for me was the specific way these cookies you have in the photo are diagonally spliced. That’s just the way my grandmother cut her cookies, too. The only difference that I can see between your photo and my memories of them was that the hole in the middle of my grandmother’s cookies were a lot larger…almost bagel-hole size, if you get what I’m trying to describe. Oh, how I wish you could just cyber-magically send me some of your already-made biscotios for me to sample, so I can tell for sure if they’re the same ones. OMG! What am I saying! I can do that myself, as you’ve so very generously given the recipe! D’oh! I will definitely try this recipe (not to mention the borekas/burekyas/’bee-yee-koos’ recipe) and let you know. This is such a brilliant, wonderful site and blog, Linda. Thank you so much! Oh! I just remembered something else about these cookies. They were sort of crunchy and crumbly, but not rock hard. Not ultra melt-in-your-mouth either, but they were amazingly utterly butterly, if memory serves. Do the biscotios you make have that sort of texture? I simply cannot wait to try these recipes out myself. I was also wondering (your blog has really stirred the cook and baker in me – especially the Greek Sephardic side of me) if there’s a cookbook aimed specifically at Sephardic Jewish culture? With recipes for these and borekas in them, maybe? Hi LInda – I’m just about ready to try your recipe for biscotios de huevo, except that I’m missing three ingredients – that being the masticha (I doubt even that specialty food shop I found the feta cheese in last week would have this, but it’s worth a try to at least ask them) and the ground anise, as well as the orange juice/oranges (which of course I can easily get at my local shop this afternoon). I have a feeling that our local shops here won’t have anise, but maybe the local health food shop might have it (and if they do, it’ll be organic – even better!). I made Linda’s biscotios recipe twice–to rave reviews. The masticha is optional and I did not use it. I couldn’t get ground anise and I used 1 teaspoon of vanilla. We loved the cookies. Good luck with your baking. Hi Norma and Linda – Opinion from the hubby on my first-time-ever biscotios this evening: an 9 out of 10. He said that they were a bit overly eggy, but thinks that’s definitely not due to the fault of the recipe or of my ability to follow the recipe, but that our normal brown Irish eggs (we don’t have white eggs here) are more intense than American eggs, and so perhaps the next batch I make, I could use two eggs instead of four. Other than that, he absolutely adores them, and told me to put them away lest he devour 10 more before the evening was over! I’d say that’s a ‘result’ and a big ‘thumbs up,’ na? As for the anise, I was delighted to find it in our local health food shop. It was whole star anise, and so I had to grind it up myself at home (which made the whole baking experience that more exciting and inspiring and fun), but I also added just a drop of vanilla, just bec ause we both are fans of vanilla whenever I bake non-savoury pastries. I think I also could have rolled the ‘logs’ into smaller logs, as the holes in the rings came out quite small in some cases, when the biscotios were baking (and the dough expanded). That would also explain why the total of biscotios I ended up putting on the baking trays only amounted to 60, not 80. I obviously made them a bit too thick, and used more dough per biscuit than I should have, but….well…I’m sure I’d be forgiven. But other than that, they taste wonderful, and I’d really like to think that my nunna is looking down from heaven and would have liked these…not as good as hers always were, but then, she’d been making them for decades, and probably learned it from her mother or grandmother…but to me, they brought back all sorts of memories, which is what I’d hoped for from the start of my journey. I am so pleased with the result, that I cannot wait to make another batch. And at the rate we were munching our way through these, it won’t be long before I make another 60. Thank you so, so much for this recipe, Linda, and for this brilliant blog (sorry if I sound like a broken record), and Norma, thanks for your suggestion about the vanilla. If ever I can’t find anise, I won’t worry about switching over to vanilla. HI Greek Girl, I am so happy your biscotios came out great. You will definately get better each time. If you really wany to try the Anise, there are mail order spice stores, but I am sure when my Nona first came to the United States, they couldn’t find half of the stuff they usually cooked with. They probably eventually found anise from the Italians or the Armenians. The food comes out great without or whatever you want to innovate with. Let me know if you need the Spice Store Links. Also I found the dessert you keep remembering it is called Kofyas or Middle Eastern Sweetened Wheatberries. There is a recipe for it in Gil Marks’ book, The World of Jewish Desserts. Thank you so much, Linda, for this list of Sephardic cookbooks. Now if only I could win the Lottery (or my hubby becomes rich and famous in the art world – which I know will happen one day), I can and will buy them all – and of course, try all the recipes out, one by one. I made another batch of borekas last night – this time spinach and cheese ones, and they came out even better than the first time, according to hubby. My confidence is growing with each recipe I try out. Thanks, too, for the challah video and recipe. That’s next on the list. I’ve not tried to make the hamantashen, so perhaps I’ll do both in one day’s worth of baking. I was also thinking of making a honeycake one of these days, although I know it’s more for serving at Rosh Hashana. I’ll have a look and see if you have a basic recipe or any tips on baking this classic. Thanks again, Linda. Oh, and I’ve e-mailed the Sephardic Temple asking them for their cookbook, but so far, have not heard back from them. Perhaps they’re being inundated with requests for the cookbook, thanks to many readers of this blog wanting a copy. Thanks Linda for pointing me in the right direction in finding your recipe for the honey cake. I’ll have a look at past blog entries you’ve written and will definitely have a go at baking it. Quite simply put, you – and your wonderful blog – have become an inspiration to me. Although I have no big Jewish family to cook and bake for, and I know no Jewish people here in Ireland (not yet, anyway), I still want to reconnect with my heritage and the wonderful childhood memories of my grandmothers and their culinary gifts (both of them – my dad’s parents were from Russia). My hubby loves the fact that I’ve found your blog and that I’m experiencing true joy making these delicious foods, and also, of course, that he gets to be the judge of my efforts, LOL. Once I feel a bit more confident, I am seriously considering organising a Greek themed party, and invite all my Irish friends and neighbours ’round to sample my Sephardic fayre. I absolutely love cooking – especially baking – and now that I’ve found this blog, there’s no stopping me. Another ‘a ha!’ and ‘Eureka!’ moment just happened, and I am so thrilled that I had to share it with you. Remember I’d written that my nunna had called these beautiful tea biscuits by a certain Greek word, but that I couldn’t quite remember it, only insofar as, from memory, it sounded like or similar to or had the partial pronunciation of ‘koo kool ria’ or ‘kool kool ya’ or something like that? I knew for certain that she never referred to them as ‘biscotios,’ but when I read your recipe, saw the photos and tried the recipe myself last week, I knew it was the exact same cookie or tea biscuit, except with another word. Well, just purely just by accident, I was searching for Sephardic, then Middle Eastern, then Greek desserts on YouTube, and came across this YouTube channel called Greek TV, so I thought I’d at least have a little look-see. It’s presented by a lovely Greek-American woman, and on this particular segment, co-hosted by the amazing Martha Stewart, they happened to be preparing a feast for Easter…Greek Orthodox, I’m presuming. I wasn’t really interested in the religious aspect of it, but once the presenter (forgive me, I’ve forgotten her name) mentioned that she’d also be preparing Greek cookies, I stayed tune for the entire segment. After they made a braided bread (that looked quite similar to our challah), and took the roasted lamb and potatoes out of the oven, and sampled the spanikopita, the presenter said the magic word. Upon hearing it, I nearly fell off the couch as well as actually audibly gasped, and felt a lump in my throat. It was at that moment – upon hearing the actual word my nunna used – with the exact pronunciation that finally jarred my memory and with it, more childhood memories of family get-togethers – that I knew, beyond a shadow of any doubt, that the word this presented uttered was ‘that’ word that my nunna always called her special, amazing cookies. I don’t know how to spell it, but I can phonetically pronounce it for you. She and my nunna both pronounced it as: ‘koo LOOTHE ya.’ The ‘loothe’ part rhymes with the word ‘smooth.’ But because my nunna and this presenter spoke so fast when saying the word, it always sounded like/still sounds like ‘kloothya.’ When I was a kid, it sometimes even sounded like she said ‘kloodya,’ (as if she was saying the girl’s name Claudia…well…sort of). Anyway…that’s the word. I know it’s absolutely, positively the word/term my nunna used. No question or doubt in my mind. So…now that I’ve finally found this out (I’m still grinning just thinking about how overjoyed I felt upon hearing this word, after many years of trying to remember it) what I need to know now is how to actually spell it, and, more importantly, if it’s actually a Sephardic biscuit, or a Greek biscuit that my nunna incorporated into her own Sephardic way of baking, and also, how different it is – or similar – to your biscottios de heuvos. As I’d said earlier (sorry for babbling on and on like this, but I’m so excited, as you can probably tell, LOL), when I saw your photos and tried the recipe out myself, it was exactly the way I remember the cookies tasting when I was a young girl. If anyone can help me with the spelling and the recipe (how it differs or how similar it is to yours), I’d be very, very appreciative. Thanks to everyone who’s been had to put up with my rambling and meandering as I’ve just done. I’m just over the moon about this – and to think I nearly stopped watching that YouTube video when I realised it wasn’t anything to do with Sephardic cooking! I think it was meant to be that I found this particular segment, nu? Hi Greek Girl, you are having so much fun! May Nona used to make something similar with sesame seeds on top , but not sweet at all, no sugar, called panderas or panderikas also my mom made these toasts with cinnamon on top called parmakes. I am thinking since your Nunna lived on a really small island the Greek influence was stronger. The syrians make something called kaak, sweet or plain, same thing. Well its Purim tonight and I will give out my Platicos or Mishloah Manot tomorrow and then on to Passover preparations. 30 days to go! My site move took a lot of time but now I am back on track and will begin to post. Hi Linda – Yes, you’re right – I truly am having a lot of fun playing culinary detective. And I’m not done yet, LOL! I’m now digging deeper into the roots of the Jews that came from or lived in Iannina (Janina), and have just discovered that although they do refer to and think of themselves as Sephardic, and for all intents and purposes, they are considered Sephardic Jews in Greece and the larger Sephardic diaspora around the world, they are, in actuality, called Romaniote Jews – extremely similar to Sephardic, but different in other ways, as well, as I am only just learning now – the internet is an amazing tool for this sort of thing. This may indeed explain why certain names of dishes / recipes that my nunna used were so similar, but yet different in the names of things, to other regions in Greece or the islands, or in Sephardic cuisine in general. Case in point – the biscotios that my nunna called ‘kloothya’ (I am still researching this term, by the way – and I will not rest until I find out exactly where it originated from, how it’s spelled (I’m sure the way I’m spelling it here is completely wrong, but the only way I know it, like I did with ‘bee-YEEK-oos,’ was to sound it out, phonetically, from memory, so please bear with me). I also found a Sephardic Temple in lower Manhattan, with a sisterhood and brotherhood that is deeply rooted in the Jews that came from Ioannina, so I’ve e-mailed them for more information – hopefully, they’ll be able to help me with my culinary sleuthing. In the meantime, if your mom knows anything about Romaniote Jews or Jews from Ioannina or the biscuit that sounds like ‘klooth-ya,’ please let me know. With that, I wish you and everyone on this wonderful blog and website a very happy Purim. Enjoy your platicos tomorrow and your hamentashen tonight.